U.S. Soldiers and Afghanistan soldiers conducting an air assault mission in Khost, Afghanistan. 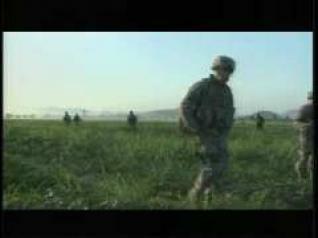 Scenes include U.S. and Afghan forces getting off the back of an military aircraft, U.S. Soldiers using dogs to search an area, Soldiers destroying a supply of weapons with a controlled detonation, Afghan soldiers handing out food to Afghan children and U.S. and Afghan forces getting back onto a military aircraft and taking off.